Tech & Opportunity: can all kids be "digital natives?" New technologies are also bringing new anxieties for parents. What is all this screen time doing to children's development? Assuming that just because a baby picks up an iPad or locks you out of your password-protected phone seems for some to be proof that anyone younger is a "digital native" and inherently able to program a DVR. But, what all this talk about digital natives doesn't take into account are access to technology and the types of technology available to kids across the class spectrum. 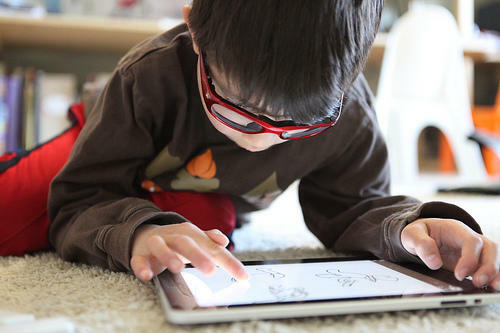 Some parents are concerned that their kids have too much access to technology. But what about parents who, because of finances, are afraid for their kids who have little to no access to the latest gadgets and learning tools? NPR's Eric Westervelt recently reported on the Coachella Valley Unified School District in California and the plan to distribute iPads to all K-12 students. More than 80% of the district's kids are living in poverty, so there are high hopes, as well as some skepticism about the impact introducing tablets will have on kids' learning. Notable about Westervelt's report were the perspectives of students that asked a lot of astute questions about the value of education via technology and what teachers could actually convey with an iPad as an intermediary. Children in poverty are also more knowledgeable than they're given credit for in understanding the circumstances of unreliable access to connectivity and questioning budget priorities when it comes to the latest gadgets and techno-optimism. This move by educators and administrators in Coachella has a lot riding on it. Contemporary ideas about "welfare cheats" often focus on the technological access that people assume those living in poverty shouldn't have access to because they're poor and receiving government assistance: "They use food stamps and their kids have an XBOX?!" "How can they afford an iPhone, but still need to be on welfare?" These accusations presume to be all-knowing about what other people should and shouldn't be able to afford without actually taking the time to talk to people or exercise some empathy and imagine the ways people find to access technology. And, yet, the rallying cry for "everyone" having access to technology, information, and the internet seems to stop short when it comes to poor people living in the U.S. There's a growing information communications technology for development (ICTD) movement of researchers and technology companies spurring social entrepreneurship outside U.S.' borders. Those in the ICTD field are working to make sure that people in developing nations aren't left behind when it comes to mobile and assistive technologies. There's a gap in our thinking about technology and who "deserves" access to it. That gap is informed by our ideas about people living in poverty. As much as concerns about the U.S. falling behind in the STEM fields are relevant to children's education and occupational prospects, when we think about kids using technology, we're only thinking about some kids. Until school systems and parents start to think through and around biases about what impoverished kids are capable of when given the right tools, we might be actively creating a wider gulf between the digital have's and have not's.